The Encyclopedia of Juvenile Delinquency and Justice is a compendium of more than 200 contributions written by leading scholars from the fields of criminal justice, justice sciences, social work, and sociology. It incorporates the latest research, policies, and practices regarding young offenders, the processing of juveniles within the court system, and various approaches to treating and eliminating juvenile crime. Organized alphabetically, the entries in this Encyclopedia encompass several major themes. A series of entries focus on juvenile delinquents and delinquency, specifically the causes, correlates, and experiences of at-risk youth. Further entries provide a comprehensive review of the system developed to address juvenile offending, including the historic origins of juvenile courts and the cases that have shaped the contemporary system. Finally, contributing authors summarize current treatment programs and policy initiatives designed to mitigate and/or prevent juvenile delinquency. Key topics covered include: Juvenile Delinquency, Explanations of Delinquency, Correlates and Contexts of Delinquency; and all aspects of Juvenile Justice and Juvenile Justice Policy. 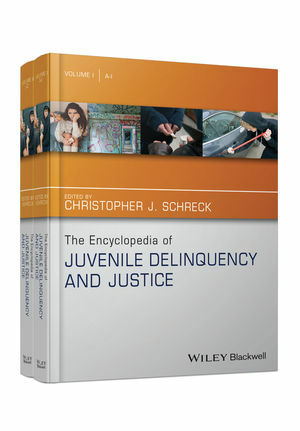 An indispensable reference resource, The Encyclopedia of Juvenile Delinquency and Justice is essential reading for both students and professionals engaged in the fields of criminology, juvenile delinquency, justice administration, and sociology. Christopher J. Schreck is professor of Criminal Justice at the Rochester Institute of Technology. He received his Ph.D. in Crime, Law, and Justice from the Pennsylvania State University in 2000. His research has focused on developing theories of victimization, but he has also published research on subcultures of violence, school safety and security, youth violence, and fear of crime. He is the author of Criminology: A Brief Introduction (4th edition, 2013) with J. Mitchell Miller, Richard Tewksbury, and J.C. Barnes. Dr. Schreck is a past editor of the Journal of Crime and Justice and the Journal of Criminal Justice Education.